Fielding was not given much importance as batting or bowling until Jonty Rhodes came into the cricketing world. Jonathan Neil Rhodes is a former South African cricketer, whom fans regard as the greatest fielder of all time. He marked his presence in the world of cricket with his unbelievable fielding on the ground. Fielding at backward point, Rhodes made innumerable records with his diving and accurate throwing ability. Rhodes became the talk of the world with his famous run-out (he ran Inzamam out) during South Africa’s fifth game of World cup against Pakistan in 1992. His diving run-out from backward point fielding position is still one of the most memorable moments of that World cup and a defining moment of Rhodes’ career. The South African took 105 catches in tests and 127 catches in ODIs. He even holds the record of most dismissals by a fielder other than a wicket-keeper to his name. Rhodes is the cricketer who has the credit of bringing a revolution in the fielding department of cricket. The Indian cricket team right now is in top form dominating all the other countries of the world. The ideal balance between batting, bowling and fielding is the main reason contributing to India's success. During the 20th century, the fielding level of the Indian team was not great. Ravindra Jadeja, while fielding at the point position has raised the level of fielding in Indian cricket. His diving catches and bullet speed throws are a treat to watch. There are various instances where Jadeja has turned the match around with his spectacular fielding. One such incident happened against India’s top rival Pakistan during the ICC Champions Trophy 2017. 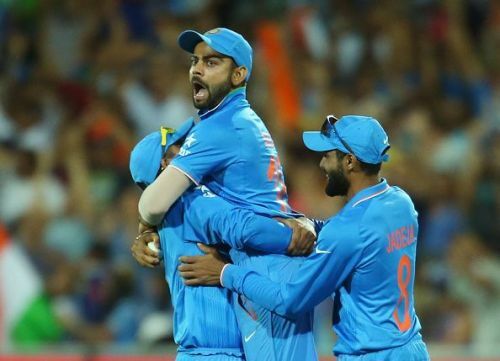 After electing to bowl first, the Indian team posted a huge total on the board. Because of rain, Pakistan had to chase the revised target of 289 runs from 41 overs. Pakistan was motoring towards the target when Jaddu turned the match on his own, Jadeja’s bullet throw ran out Pakistan’s main striker Shoaib Malik. Despite having an awkward angle to throw, Jadeja got the bulls’ eye as Malik had to go back to the pavilion.